Free Garnier Fructis Brazilian Smooth Sample Pack! 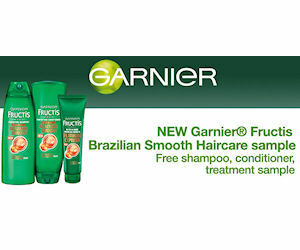 Sign up for a free Garnier Fructis Brazilian Smooth Haircare Sample pack! Receive a free shampoo, conditioner and treatment sample. NOTE: This form is intended for use with mobile devices, so if you have trouble with the form please try from your mobile device, a different browser and refresh the page.